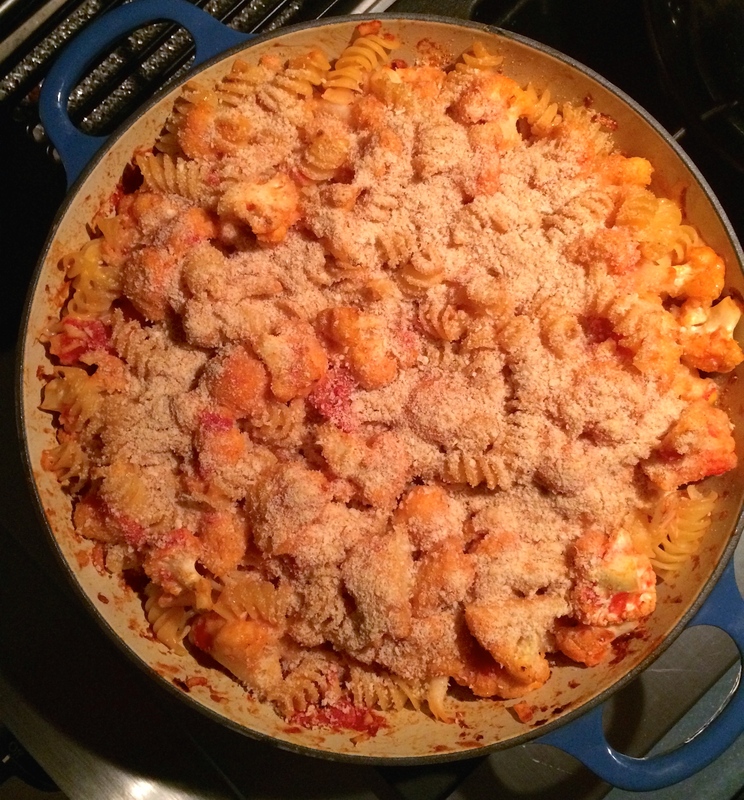 Betsy found this Alton Brown recipe for Pasta with Roasted Cauliflower. They liked it so much that she forwarded it to me, recommending the I cut the red pepper flakes by half. I adapted it slightly, but it rings true to the original. This is a great addition to the Meatless Monday file. Le Creuset pan. Something ovenproof. Roast in the oven for about a half hour, stirring after 15 minutes. 3. Carefully remove the pan from the oven, remembering that it’s hot! Add the canned tomatoes, garlic, and red pepper flakes. Cook until well blended. About 5 minutes. 4. Cook the pasta in boiling water with the remaining 3 teaspoons of salt until the pasta is al dente. 5. Reserve 1/4 cup of the salted cooking water Add the drained pasta to the cauliflower mixture, along with the reserved pasta water. Stir in the cheeses, and top with breadcrumbs if you wish. 6. Return the pan to the oven for another 15 minutes, until the cheese has melted. Just as a closing note. I added the breadcrumbs this time, but I don’t think that I will next time. I think that the addition of shredded basil or fresh thyme would be good. Also check for seasoning. You might need a little more salt.